Last month the FT wrote about the countries that will be driving global economic growth in the years ahead. But companies trying to prepare for a future world of opportunities offered by new markets must be ready to face new challenges. One of them is corruption. The FT article listed the 10 fastest growing countries in 2013. According to Transparency International’s Global Corruption Barometer 2013, a business seeking to set up in one of these countries might face some serious corruption problems. The survey, which asked 114,000 people in 107 countries about their experience of corruption, covered seven of the countries that made the FT’s top 10 growth leaders list. 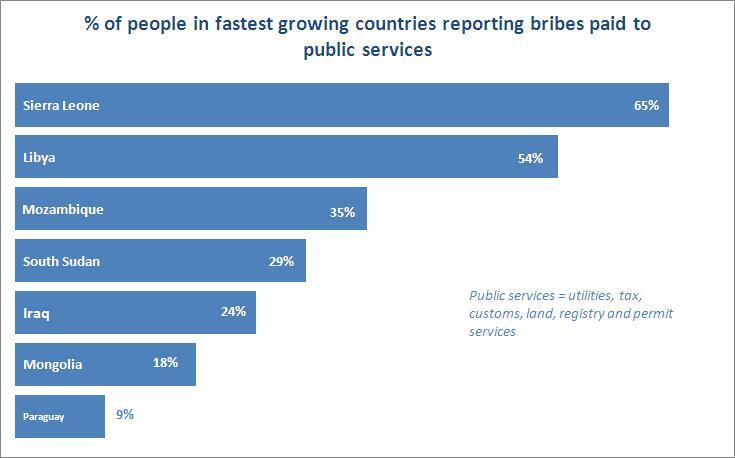 One-third of the people surveyed in these seven countries who came into contact with public services reported paying bribes. These public services, such as tax and customs authorities and land registries are critical to setting up shop in a new market. Seven of the world’s 10 fastest growing countries are covered by the Global Corruption Barometer 2013. Here is how many people reported paying bribes to four public services. For a company getting a new business hooked up to the power grid, buying land to build a shop or factory, getting a permit for a particular activity or getting goods through customs, there is a risk that bribes will be demanded to secure or speed up the process. The fastest-growing countries in the graph above have clocked GDP growth rates from 32 per cent (South Sudan) to eight per cent (Mozambique). Business opportunities abound. These growth spurts are most likely driven by strong demand for natural resources (all but one of these fastest growing countries are defined as resource rich by the IMF). This means the growth might be rather short-lived if corruption goes unchecked for very much longer. Worryingly, in only two of these countries (Sierra Leone and South Sudan) do more than a third of citizens rate their government’s anti-corruption efforts effective. Corruption will make it progressively difficult to turn the gains of short-term growth into long term benefits. Companies paying bribes risk more than the price of the bribe. If caught, they face reputational damage, lost investors, and undermining a level playing field for business. The Global Corruption Barometer also warns that half of consumers are willing to pay more to buy from a corruption-free company. Companies paying bribes, therefore, trade short-term gain for long-term instability. The chance of getting caught is rising. Legal action against companies that engage in bribery can be taken not only at the local, but also at the international level. Forty countries are committed to enforcing anti-bribery laws that reach beyond their borders under the OECD anti-bribery convention. Enforcement of these rules is more robust and comprehensive than ever – more than 300 investigations are ongoing in 24 countries around the world. For more than a decade now, Transparency International has provided a six step approach for companies to help them manage their corruption risk. Publicly report on key corruption-relevant indicators, including their anti-corruption programme, organisational transparency and key financial data on a country by country basis. Emerging economies and multi-national companies need each other: business and investment are the drivers of growth. Business has great power to play a positive role in emerging markets, if they operate cleanly. The challenge is to get it right in these emerging markets, to benefit people as well as economic growth. ← Are high bribery rates in poor countries blocking development?